How do I know my child is saved? What if my child says she wants to be baptized? My child walked down an aisle at a summer camp and said he prayed to Jesus; what do I do? As Christians, we never want our children to experience sin or follow in our sinful footsteps. So, we pray, we teach, we model, we love and we present the gospel to them. But what do we do when little Sue says she prayed to Jesus? What tends to take place in our excitement is we run to tell everyone the good news. Then we measure our child’s salvation in two unhealthy and even damning ways. We measure their memory and their behavior. We cross our fingers when we ask them to repeat scripture or catechisms and judge how they treat their siblings or friends. Why is this so reckless as parents who desire for their kids to walk with Jesus? As parents we need to go deeper, especially if our children have experienced a Christian culture their whole lives. Good deeds do not mean a changed heart. We must stop, pray, and then ask our child what happened and what they mean when they say they prayed to Jesus. We forget discipleship is a lifelong journey. It is more important to know WHY someone does something than to monitor what he or she is doing. God says he looks at the heart (1 Samuel 16:7, Luke 16:15). God is going after and changing our whole being; our affections! Salvation is what God offers in Christ’s life, death and resurrection- to be a new creation (2 Corinthians 5:17). The gospel is not just a theological concept to be memorized. The gospel should change what we believe, who we are and how we live! No matter if your child gets all the answers right or can’t sit still for more than two minutes, you have to fight for the ‘WHY’. The ‘why' addresses the heart! What do they love more than anything? What do they value so much that they get mad if you take it away from them? What wants do they have that cause them to become angry if they don’t get them? What are they looking to for satisfaction, happiness or provision? These are not softball questions for your kids but they, like Jacob, have to wrestle with God! I’ve recently been given several opportunities to walk other parents through considering where their child is spiritually. These kids are not walking down an isle or professing Christ in a family worship setting. I’m reminding myself of these simple truths and I hope you can incorporate them in your discipleship mindset of your kids. 1. Make sure your child has the essential foundation for the Christian faith. The Christian faith is not subjective; there are things one must believe. I have heard children and young adults say “I went down the aisle and asked Jesus into my heart”, but in asking just a few questions, I realized they could not define who Jesus is, what sin is, or what they meant by using the word ‘heart’ in the most basic sense. The church has a knack for developing universally used phrases and not explaining them. The phrase, “ask Jesus into your heart,” is by and large one of the most common unexplained phrases. I won’t go on a rant here, but I will say that we as a church should do a better job of biblically calling people to repentance and faith in our great God and King. The basics of belief would include things such as God being the creator of all things, the Trinity, the effects of Adam’s sin, the Law of God, the virgin birth, the perfect life, the death, the resurrection, and the ascension of Jesus for the glory of God and forgiveness of sins, the sending of the Holy Spirit, and the return of Christ. Paul lays out a clear picture of the gospel in 1 Corinthians 15:2-4. If you’re struggling for a place to start, start there! 2. Ask clarifying questions! PLEASE! Sometimes we give our kids way too much credit. Kids have the natural ability to absorb content which means they can repeat back those universal church words or phrases they pick up along the way. Judah loves to tell me things he hears about Jesus or the Bible and one of the first things I do after thanking him for sharing is asking what he means by that. There are times when he heard something, and it sounds great, but he has no idea what that means. We do this as adults too. If I were to ask you “what is the gospel?” or “explain to the best of your understanding ‘the Trinity’”, most of us would struggle to articulate. 3. Teach them repentance and faith. Repentance and faith move our hearts! Repentance is taking place when children cry not because they got caught or because they have to get a spanking but, rather, because they have sinned against their God. When children are asking you questions about God at unprovoked, random times in the day, they are exercising their faith. 4. Expect them to believe what you believe and push their minds to think outside of the world in which they have been graciously placed. One night during family worship I told Judah that many people believe humans were born from old animals (apes). Judah laughed, but I was straight-faced. I said, “Judah more people believe that then they believe in God. They laugh at mommy and daddy. They think we are silly.” Judah hears the truth all the time, so I have to stretch his mind. I want him to be in the real world, not a Christian bubble. I want him to remember my earnest desire for him to know what he believes by challenging his beliefs with me! 5. Ask for your community to help. If you feel your child desires to submit his life to Christ, then he’s coming into a forever family. Your Group or Missional Community is a great place to ask questions. These can be the people who walk with you and your child as you both grow in faith and repentance. • Children who are professing Christ must be able to share or define (even in the basic sense) what they believe about God, sin, Jesus’ work on the cross to forgive their sin, and what this means for their lives (how God is changing their belief/heart). • Children who are professing Christ should be heart-broken over sin and thankful for God’s great grace. They should be concerned as much if not more with WHY they are doing something then what they are doing. • Children who are professing Christ should desire to follow God – not forced to spend time with God. • We must pray for God to call our children to repentance and faith as we display and declare the gospel to them. • We have to be willing to tell our children what the world believes and explain why Jesus is truer and better than any other belief! • We have to ask really good questions. Do not just take a few catechism questions and answers and call it a day. Dig deep with your child as you have ongoing conversations! • We have to be pursuing their hearts! • As parents, we should invite our Christian brothers and sisters into our children’s response to Christ and future life in him. When we (you) are baptized we are expressing our belief of forgiveness of sin bought by Christ and are brought into a HUGE faith family (read The Family and The Church). Parent, you are not alone! The church has been given to you and you have been given to the church all for the glory of God and the growing of his kingdom! If your child is asking about her next step with Jesus, the first step is to continue to disciple them and help them understand what that means. Be excited for your child, yes, but walk him/her through each word and help him/her grasp the power and presence of God! If you feel your child has made a quick or peer-pressured decision, do not rebuke them. This is a great time to love them and rejoice that (s)he is taking steps towards some form of godliness. As a spiritual family do not neglect the spiritual gifts of others to help share the good news of Jesus with your child. Involve people that love Jesus, love the Church, and love you to be a second voice in their life. When you see your child desire God take them to the next step: baptism! One last thing, you are not a bad parent if you asked your child to wait a few weeks to get to know what took place in their heart. If you are a Christian, your identity is not a “bad parent.” Your identity is a son or daughter of God. Like I just mentioned, be excited for your child, but love him/her well. Press into his/her words. It is OK. He/She will appreciate the time and care you gave them when they are older. One of the harshest realities of Christian parenting is accepting that we cannot make our children become followers of Jesus. We can and should influence godly disciplines, but Christianity requires a heart change, a change in affections. According to Scripture, the Holy Spirit convicts of sin and empowers people to glorify Christ (John 16). The Holy Spirit brings about eternal significance and salvation through repentance and faith in the person and work of Jesus Christ (Acts 15:11, Eph. 2:8). In fact, we harm our children by attempting to change their hearts through behavior modification. Why? Behavior teaches our children to deal with sin through pride or fear. Behavioral modification is the opposite of the gospel! So we must display and declare the gospel in every area of our lives, not just the overtly, easy ‘churchy’ environments. In “Seeing and Savoring Jesus in Family Discipleship”, we looked at the first part of family discipleship which begins with you and Jesus. The second part of family discipleship is between you and your children. There are six things to consider when it comes to your relationship with your children. 1. You must expect them to sin, a lot, for the rest of their lives. 2. You must be selfless. 3. You must ask others for help. 4. You must disciple/train your children throughout the day. 5. You must be ready to shepherd their hearts. 6. You must expect to disciple your children for the long haul. Let's go through each one very briefly. As parents, we expect “good kids.” But there are not “good children” and “bad children”. There are children with easier temperaments who need Jesus, and there are children with harder temperaments who need Jesus. We should not expect any of our children to love and follow God without first understanding who he is, the joy that is in him, their need for him because their sin. We do our children a disservice when we treat them like saints who should not sin. Much of our discipline and correction stem from false dreams of our child being the one who will change the world (or at least your future) instead of realizing that the real World Changer has already come into the world over two thousand years ago. When we portray the “Jesus complex” unto our children we expect too much from sinners (like us). This causes our children either to hide their sin due to fear (they get really good at this) or to become superior in their morality and demand others do the same (which incites pride). When we ignorantly teach them that their sin is a bother to God and to us, we miss an opportunity to teach them the real reason that Jesus has come. My son Judah knows Ephesians 6:1 very well. It states, “Children obey your parents in the Lord for this is right.” When Judah disobeys in a variety of ways, my first goal is to let him know that I knew it would happen. I say, “Judah I know you can’t be obedient all the time. I can’t be obedient all the time. That is why Jesus has come.” I want him to know that he does not have to lie, not because telling the truth is “the right thing to do if you are a good boy” (which incites pride) or that lying will get him into trouble (which incites fear), but that he can tell the truth because he will be my son no matter what he says (which incites love and grace). If our first response is, “how dare they do this frustrating thing”, we have placed a burden on our children that they cannot bear (Acts 15). If you are demanding the impossible from your children they miss out on true forgiveness and grace found in Christ through our discipleship of them. Real forgiveness through grace from us as parents is something they must experience. If we want “good children” they miss out on Jesus, for Jesus says, “no one is good except God alone (Mark 10:18).” You do not need good children you need redeemed children. Christians are called to run the race set before us, throwing off every sin and hindrance that would so easily entangle us from the goal of enjoying God. Marriage is also a step of voluntarily putting down selfish hindrances in order to devote oneself to another (1 Cor. 7:32-35). In marriage there are also opportunities to sacrifice one’s own desires, even godly ones, to devote to our children. God uses marriage and children to sanctify us. Being selfish is hard to see from one’s own perspective but in a community it is visible. When we live for ourselves but have a family, it is obvious. Selfishness looks like you ordering your children and spouse around to fit you and your lifestyle. When you’re tired, everybody should be quiet. When you are busy everybody should go to the other room, when you want to relax everybody should play somewhere else. When you want to play everybody should stop what they are doing to play with you. But God has changed our purpose from glorifying ourselves to glorifying him. In Christ, we let go of our plans to follow his. At least that is what we meant when Jesus said, “Follow me, and I will make you fishers of men (Mark 1:17)” and “Whoever wants to be my disciple must deny themselves and take up their cross and follow me. For whoever wants to save their life will lose it, but whoever loses their life for me will find it” (Matthew 16:25-25). Without Christ, denying oneself is an impossible task. You must surrender to Christ before you lead your children. Only in Christ will we as parents be ready for whatever the day in the home will be like. You must be willing to stop looking at the magazines and Pinterest to live in the world the Lord has given you to steward (Eccl. 3:22). God has not given you a raw deal. He has allowed you to surrender to him as you co-labor with Christ in parenting those He loves. We must ask others for help. Oh how we have believed the lie that the Christian community is to be compartmentalized and only exist within the confines of two hours on a Sunday. We need each other. Parenting is hard, but in a gospel community there is a lot of listening, help, encouragement, prayer confession, and fellowship. Allow your children to grow up around a community of gospel-centered people in day to day life. Your children need gospel-centered people in their lives more than they need to watch Veggie Tales. Who will your child go to when times get hard, and they are still unsure of how you as a parent will respond to their sin? If there is a gospel community, you set your children up to go to people who love Christ and you. Deuteronomy 6:5-9 shapes the times we as parents should disciple our children, “You shall love the Lord your God with all your heart and with all your soul and with all your might. 6 And these words that I command you today shall be in your heart. 7 You shall teach them diligently to your children, and shall talk of them when you sit in your house, and when you walk by the way, and when you lie down, and when you rise. 8 You shall bind them as a sign on your hand, and they shall be as frontlets between your eyes. 9 You shall write them on the doorposts of your house and your gates.” According to Scripture we are to be teaching our children about God, his love for his glory, his love for his creation, his redemptive work and our joy in him for all he has done. Sometimes I let my kids be rambunctious while other times I have to stop and remind them how important it is to know that God is in our midst. This is the reason we read, sing, and pray — to put us in the path to see the greatest and glory of God! I love these family devotional times but these cannot be the only times. Why? Because our children learn where our affections are from our day-to-day worries, attitudes, and actions. Our children need to be devoted to our scheduled family worship times but we, as parents need to be devoted to worship our good and holy father all the time. The more times throughout the day I can remind myself, my wife, and my children who God is, what he has done, who are we in Him the more opportunities we put ourselves and our family in the pathway of God’s grace. We tend to believe that kids who can clean their room and do their homework can understand more complex life decisions. This goes back to our selfishness. Listening, teaching, celebrating, and praying will take a huge toll on us as parents. Shepherding a heart means lovingly guiding our children to godliness and wisdom. Think of godliness as the clear standards of Scripture and wisdom for when and how to apply those standards in specific situations. If we just talk in terms of do’s or don’ts without discussing their hearts we can completely miss teaching kids what wisdom is. Our children will grow into adults (LORD willing) and if they do, following rules will be up to their discretion. You have to spend the time showing them the beauty and glory it is to be saved by God and to enjoy him through the commands he has given. Do you ever get tired of children asking why daddy/momma? Cherish those moments and use them to talk about the goodness that God has given to us in following him. Whatever you do don’t just tell them right and wrong, shepherd their heart! Get to your children before the world does. Tell them of God, creation, fall, and the good news of forgiveness and a new identity we have in Christ’s work on the cross and in the resurrection. Tell them of heaven and what it will be like so that they too can see how things ought to be! As you are proactive about wisdom there will be times when wisdom is needed in the moment. Judah is about to be 7. Throughout the past two years, he has made some negative comments about people and himself that have caught me off guard. Many times he will tell me his thought and will ask me how he can replace the thought with something about Jesus. Honestly, my first reaction is to find out who he’s been talking to! Though we should be careful concerning who our children’s mind and hearts are spending time with, I know that Judah’s heart was not pure from the beginning. He is growing into a broken world, and he too is broken himself because he inherited a sin debt from our first parents, Adam and Eve. In order to answer his question I need to shepherd his heart then just make the correction. This means I must listen to him and ask good questions. I will ask him what he thinks about what he said and why he wants to replace it. Where is his heart (heart=affections) right now? As Judah grows he is going to need an ear for all the crazy, evil, and adventurous thoughts he will have. Yes, we want him to know and believe the truth. But first, he must know I care about what he truly believes in this moment about how he sees and interacts with God and the world, and be able to express it freely. You must expect to disciple your children for the long haul. At a certain point when children understand the do and don’ts, we take that as a signal to slack off of our training/coaching and begin to primarily be a corrective voice. But that is the point they need your life to reflect and shine Jesus. This is the point they need to see you fail and repent. As your children get older you lose more authority in their lives. But what can continue to grow from childhood to adulthood is your influence in their lives. They need to see you taking seriously the call to love them unconditionally and be in a Christian community. You won’t get much by them at this point. All correction will need evidence. Your children need you to show them Jesus in the everyday stuff of life, not in your perfection but in your open repentance. Why do you discipline your children? When I ask others or myself this question, I see a common thread: I don’t want to be noticed as a bad parent or to be embarrassed my children’s behavior. If good behavior in private or public is your goal as a parent, then your kids will always disappoint, and you will let them know it. You will use pride or fear to get them to stop doing that or to start doing this. And when your kids ask for a reason why, your response will be vague or without much weight. Eventually, they will stop asking why and just do it, at least when you’re around them. They will struggle to find their identity because their parents never allowed them to have one. Our children need to be free to deal with their hurt, pain, sin, and failure with someone they can trust. You do not have to be the “best parent.” God the Father is the best parent. Repent from your need to be perfect, have the perfect home, or have perfect children. None of those things are possible nor will they bring you happiness. Only the forgiveness of sin (including the sin of believing we can be perfect without Christ) by Christ’s sacrifice on the cross will set us free from chasing after such a burden. We should play, work and disciple our children because we love them, because we have been loved by our Father. If your children do not remember one verse from some summer church camp, they will be more blessed by the fact that they know their parents really loved them because they showed them an unshakable gospel. Family discipleship is a rich opportunity for you display the gospel of Jesus Christ to your kids through parenting. As you engage your family with the gospel, it's helpful to realize that family discipleship is a multi-faceted design giving your family a holistic and healthy approach to becoming learners, followers and reproducers of Jesus. Their family's relationship with the Church. All of these elements are important to family discipleship. Before diving into each of these elements, though, it is essential to understand that parents are intended by God to be the primary disciplers of their children (Deuteronomy 6:4-9). 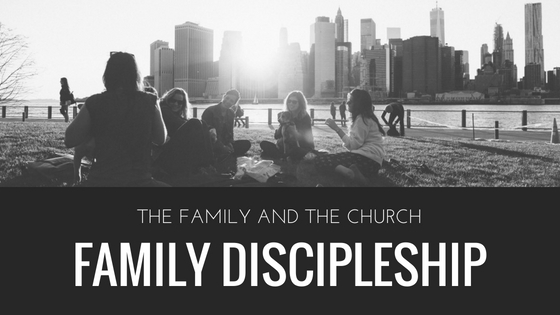 We, the Church, have two main roles in family discipleship. First, we are the secondary voice of discipleship for your kids, reinforcing Biblical, Gospel truths and affirming the parents’ authority given by God. Second, we want to teach and equip you as parents to take this holistic approach in your family discipleship. Family discipleship begins with how parents seek and savor Jesus. To be effective disciple makers of Jesus, you must have been and continue to be transformed by the gospel. If Jesus is a second thought to parents, discipleship will not be lived out before their children. Knowing the difference between taking children "to church" and allowing your children to see you "being the church no matter where you are" is key to family discipleship. If Jesus is just a church word parents use for behavioral modification (i.e., telling them to, “Stop that behavior because Jesus doesn’t like that,” saving yourself from public embarrassment), parents may cause their kids to become disciples of good behavior, but not disciples of Jesus Christ. So parents, how do you know you are personally trusting in Christ? Here are some questions to consider. When was the last time you trusted in the gospel for a family, work, or church decision? When was the last time you trusted and acted on the gospel instead of the sinful desire welling up within you? When was the last time you actually confessed sin to your family or small group because you knew that you didn't have to hide your sin from others since Christ died to set you free of shame and guilt? When was the last time you acted in faith and loved someone who didn't deserve it because you were reminded of God's great love for you on the cross, giving you forgiveness and new life despite all of your rebellion, rejection, and sin toward Him? Even if our children never receive Christ, our children will be convinced that we truly believe Jesus is everything He said He was by the way we live out that belief in front of them. This is not the mindset that most of us grew up with, and it can be difficult when you grew up in a culture of "going to church every time the doors were open". But we have to change our mindset. We have to grow up in the gospel ourselves. How do you do that? You must train your mind to focus on Christ (Romans 12:2-3; Philippians 4:8-9). As a parent, you must be reminded of the truths of the gospel and lean on the power of gospel every single day (Titus 2:11-15). You must wake up, work, play, and sleep the gospel truths for your life (2 Peter 1:3-10). And when you recognize your lack of love and loyalty to Christ, you can stop and worship the Lord in that same moment because the gospel has done the work you failed to do, granting you complete access to the Father (Colossians 1:13, Ephesians 2:1-10). Training your mind to see Christ takes practice. You can be reminded of His great love by practicing spiritual disciplines or “means of grace.” As Tim taught us in the Rhythms series at the start of 2017, many spiritual disciplines can be divided up into three major sections: hearing God's voice (scripture and meditation), having God's ear (prayer and fasting), and communing with God's people (small groups). Spiritual disciplines seem hard, but thankfully God has not made himself difficult. As we set our life to his design, we prosper. God does the transforming (2 Corinthians 3:18)! Our job as believers is to get in his path! We get into his path when we engage in a rhythm of spending time with Him. You need a time, place and plan for the spiritual disciplines in your life. Be diligent. Surround yourself with a gospel community who is ready to serve. Dallas Willard said, "Grace is not opposed to effort, but to earning." Take the next step in glorifying the Father through knowing more of Christ. Living in light of the gospel will transform how you see God's design for parenting. You will experience the perfect parent-to-child relationship that God has with you which is rooted in love. As you continue to experience this transformation, you will treat others--including your children--with the same grace you have received and are now receiving. You will give abundantly because you are now more aware of the abundant grace afforded you. Your relationship with Jesus Christ as a parent is a crucial element for you in discipling your kids in a holistic way because you are tapping into a key element of any discipleship relationship, which is “demonstration.” Dawson Trotman, founder of the Navigators ministry, explains that “Discipleship is more caught than taught.” When your kids see you loving and following Jesus, they are more likely catch on and do it themselves. Parents, if you are reading this and feel far from the grace and love of God we want you to know that in Christ we are no longer defined by what we have done or will do, but rather by the word and work of Jesus. If you not have repented of your sin and placed faith in Christ for forgiveness and restoration of your life, both now and forever, God has made this truth available to you in Christ! You will become a new person with a beautiful identity (2 Corinthians 5:17) in Christ as a son or daughter (Romans 8:14-15). A new identity also includes a new family. We, the church, are that new family. Please share with us what the Lord is doing in your life.